Thought I would share a few of the hand made charm bracelets that are for sale on Big Cartel Perfectly Polished Jewels - similar style to Dogeared but cheaper - prices from only £1.50! More will be added soon including some quirky Vintage Rings. Any requests of what you would like to see in the store please feel free to email me or tweet me! Alexander McQueen Inspired Single Silver Skull on Black Waxed Cotton £1.50 available here. 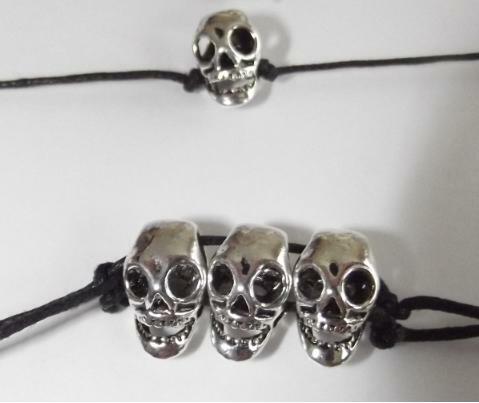 Double wrap black waxed Cotton with 3 Skull Charms £3.50 available to buy here. Hand made Tibetan Silver Cross Charm (12mm) on a 30cm waxed cotton thread - comes in Black, Red or Pink £1.50 available here. Fully adjustable and are designed to be tided in a knot.